MPs have been told they face their “last opportunity” to ensure the Brexit process is extended to 22 May and bring certainty to people and businesses. The attorney general said any further extension past 12 April would be “subject to the veto” of 27 EU leaders. MPs will be asked to approve only part of the PM’s Brexit deal, the withdrawal agreement, covering the terms of exit. Labour said separating that from the political declaration would mean voting on a “blindfold Brexit”. Up to 13 separate scheduled protests and counter protests are expected in Westminster on Friday – the day that Britain was scheduled to leave the EU. These include the “March to Leave” procession, which left Sunderland two weeks ago, which is due to arrive in Parliament Square. MPs will vote on the withdrawal agreement, a legally-binding document setting out the terms of the UK’s departure from the EU, at 14:30 GMT. Attorney General Geoffrey Cox told MPs the withdrawal agreement must be approved by 23:00 GMT if the UK wants to “secure our legal right” to an extension to Brexit. He said that the European Council last week had agreed that Brexit could be delayed until 22 May – if the withdrawal agreement was approved by the end of this week. If they do not, EU leaders have offered a shorter delay until 12 April – the date by which the UK would have to indicate whether it would stand candidates in the 2019 European Parliament elections – to allow the UK time to get the PM’s whole deal through or to “indicate a way forward”. “This is therefore the last opportunity to take advantage of our legal right and the government has taken the view that it would be wrong to allow that time and date to expire, without giving this House the opportunity to consider whether it should avail itself of the legal right,” Mr Cox told MPs. He said it did not amount to a “meaningful vote” on the overall deal – as it did not include the political declaration but he said the EU had accepted that that part of the deal was still open to negotiation, while the withdrawal agreement was not. The government says that voting on the withdrawal agreement alone will be enough to meet the criteria laid down by EU leaders for the postponement of Brexit from 29 March to 22 May while also meeting Speaker John Bercow’s requirement that any more votes on the whole deal – which has been twice rejected by large margins – must be different from the last two. 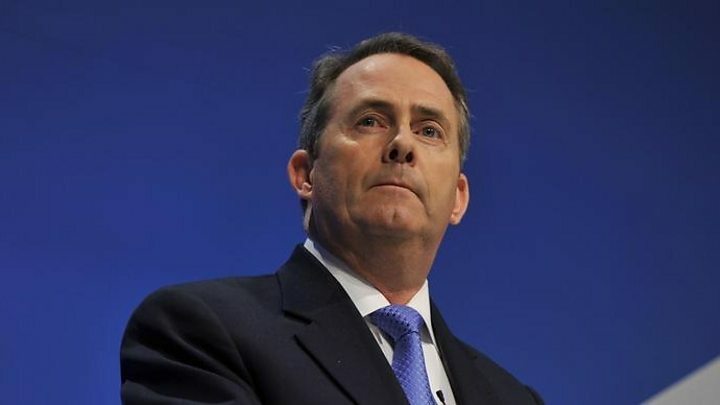 Mr Cox indicated that the government would have been willing to accept a Labour backbench amendment – had it been accepted by the Commons Speaker – which would have meant the prime minister would not have been able to sign an agreement with the EU on the longer term future relationship, without approval from MPs. He said approving the deal on Friday would “bring certainty to thousands of businesses and millions of individuals throughout this country and one million citizens of our country residing in the EU”. And Labour MP Hilary Benn questioned whether if Brexit was delayed until 22 May, but no agreement was reached by then on the political declaration, whether the UK would be able to seek a further extension. He suggested it would then be too late to take part in the European parliamentary elections, which the EU has indicated the UK would need to do if it was to get a longer delay to Brexit. The SNP’s Ian Blackford accused the prime minister of having “run down this clock, only to ignore the wishes of Parliament, the wishes of the people and engage in a game of blackmail and trickery to win support”. But Conservative former foreign secretary Boris Johnson, who has voted against the deal twice, tweeted that he would now vote for it – despite remaining “intensely critical” of it. And fellow Brexiteer Iain Duncan Smith also said he would reluctantly back the process, as did former Brexit Secretary Dominic Raab, who said that although it was a “bad deal” there was a “significant risk of losing Brexit altogether” if it did not go through. Analysts Mr Ben Rory, is Europe Editor. There is little expectation in the EU today that the withdrawal agreement will pass. If it does, EU leaders will breath a huge sigh of relief. They are not bothered that the political declaration on post Brexit EU-UK relations is being kept out of the vote. Brussels has always said it was open to renegotiating it. The divorce issues in the withdrawal agreement are their priority. The overwhelming mood in the EU today is one of resignation. For the first time, EU leaders are looking at a no-deal Brexit as a very real possibility, rather than a distant, unlikely prospect. It’s forcing them to grapple with internal issues that up until now were viewed as too much of a hot potato. Primarily what happens on the Ireland/Northern Ireland border in a no-deal scenario. EU leaders are putting pressure on Dublin to do more to prepare. The EU priority is to safeguard the single market, meaning that checks and some infrastructure will likely be necessary even if they are away from the border itself. If the vote fails today, the prime minister could opt to delay Brexit even longer. EU leaders plan to hold an emergency summit on 10 April to hear what she decides. But attitudes hardened at their last meeting. The EU will insist the UK takes part in European Parliamentary elections in May as a condition for getting a longer extension. EU leaders’ focus is no longer on the UK and whether it stays or goes. They see their priority now as damage control – protecting themselves as much as possible from any Brexit fall-out. It would either have to pass the political declaration on the future relationship at a later date, or change the law so that it is not needed to ratify the treaty. The BBC’s Laura Kuenssberg said she expected ministers to bring forward a new withdrawal bill as early as next week to begin this process. The EU’s chief Brexit negotiator, Michel Barnier, has warned the UK will face leaving the EU without a deal or a longer extension – involving taking part in European Parliament elections – if the deal does not pass. Ministers would have until 12 April – the date by which the UK would have to indicate whether it would stand candidates in the elections – to “indicate a way forward”, with the EU expected to hold an emergency summit to decide if the conditions for a longer delay are met. BBC Brussels reporter Adam Fleming said an extension of about a year was being touted at an EU meeting on Thursday, but only if the UK had a “clear plan” and if it took part in the European elections. What is the withdrawal agreement and the political declaration? The framework outlines future trade and economic co-operation, in areas such as financial services and fishing, mutual security and defence arrangements and how the UK and EU will work together and resolve disputes.